This FMC module provides access to 3 USB 3.0 ports; one port is directly connected to FPGA carrier cards via Serial Transceivers and two ports via two Texas Instrument TUSB1310A transceivers. . The TUSB1310A device is one port, 5.0-Gbps USB 3.0 physical layer transceiver that operates off of one 40MHz reference clock. 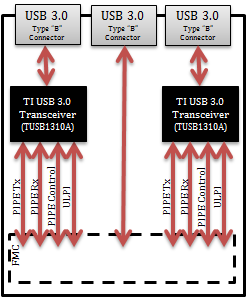 The USB controller interfaces to the TUSB1310A device through a PIPE (5.0 Gbps SuperSpeed) and a ULPI (USB 2.0) interface.